SAN DIEGO -- If you’ve never ventured east towards the desert because you think it’s just blowing sand and cactus scrub, well then you’re missing out. This time of year the Borrego Desert comes alive with spring wildflowers , but that’s not the only reason to road trip there. People from all over the world visit Borrego Springs to see the amazing sculptures created by the man many call the Accidental Artist. “It’s amazing. It is amazing,” says Karen Jennings standing in front of a giant dragon so long it’s split on two sides of Borrego Springs Road. Amazing is a bit of an understatement for Borrego Springs considering some think it’s just a barren desert. “Usually their words are like, ‘Holy crap that’s big!’” adds Jennings, whose visiting from Canada. The Borrego Desert sculptures were a five-year project for Ricardo Breceda. He got the idea after watching Jurassic Park III. His daughter, Lianna, was fascinated with dinosaurs and asked him to make one. “I started with dinosaurs. My first one was a T-Rex. I made for my daughter when she was six,” says Breceda smiling thinking back to his first attempt at metal art. This one time cowboy boot salesman decided to trade a pair of boots for a welding machine, and an artist was born. Better yet an Accidental Artist was born. His philosophy was go big or go home. 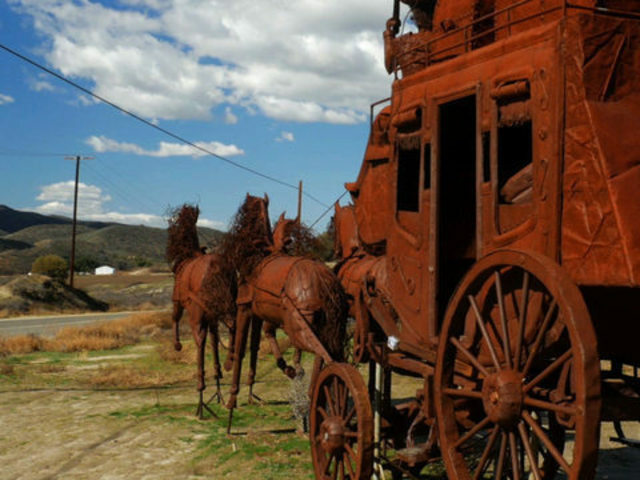 Breceda recently purchased land in Temecula off Highway 79 to house hundreds of his metal sculptures. He envisions a park with hilltop gazebos where elementary school children can take field trips to learn about art and the many themes of his work. What he needs is a new warehouse, so everything on his current lot is for sale. “All this is available, half price, everything must go!” says the always smiling Breceda. He’s become so popular he now has factories in Perris just north of Temecula and another in Baja. His meticulous attention to detail is in every custom piece of his metal sculptures. Beceda’s western theme is inescapable, and his dinosaurs are the favorite of children. But his most prized piece? 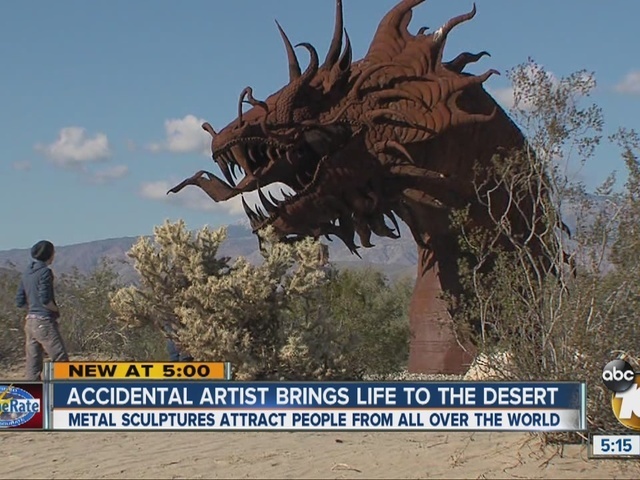 The Dragon is one of 133 sculptures Breceda was commissioned to make by philanthropist Dennis Avery in Borrego Springs. It took seven months to complete, and by far is his most popular. So much so it has become a mecca for photographers looking for a compelling subject. Breceda’s work has given life to other artists like Yorobe. The metal sculptures are the perfect experiment with nature and natural light. Borrego Springs in one of the few cities in the entire world considered a “dark sky” community because it limits light pollution. That said, if you think Breceda’s sculptures look great in the day you should see how the photograph at night. All this from a man who used to sell boots for a living before he accidentally fell into his passion. What does Breceda think of his moniker?